Recently I read an article that talked about the importance of writing things out by hand when it comes to focus, memory, and creativity. The article is here, and it’s worth a look. "'students who write out their notes on paper actually learn more,' and doodling has been shown to help focus and creativity. When I work with one-on-one clients, I encourage them to bring their own sticky notes and a pen to our sessions—even though our sessions are online. It’s not required, but I think it can be helpful for clients, especially for those wanting to learn the process and use it on their own in the future. One recent client, Christen, told me that even though she didn’t write down the steps for her project during our session, she wrote them out on sticky notes afterward and posted them in her planner. I sent her a hand pdf of the steps that she could refer to whenever she wanted- she didn't have to physically write them down. But she knew that could help her focus on her tasks. When you write by hand onto actual paper, then move that paper around in physical space, there's an inherent mindfulness that the activity brings. It's easier to focus on the task at hand. At least, that seems to be the case for me (and for the Yale psychologist noted above). All of this thinking about hand writing also got me thinking about my Bullet Journal. Recently, it's my poor, neglected Bullet Journal. I love my BuJo, but I have definitely let it fall by the wayside for the last few weeks. Now I’m convinced: I am restarting my BuJo practice! I thought you guys might enjoy seeing the evolution of my Bullet Journal weekly layouts. Notice how it starts out fairly simple, becomes prettier and more elaborate, then all of a sudden becomes the simplest design possible as my life became too busy to spend time on it! I don't feel badly about my simple layouts, though I did enjoy the practice of making the pretty layouts. Plus, when my journal appeals to my eye, I want to spend more time with it. I'd love to hear where you all stand on this issue. Do you find that you can focus more easily when you write things out by hand? 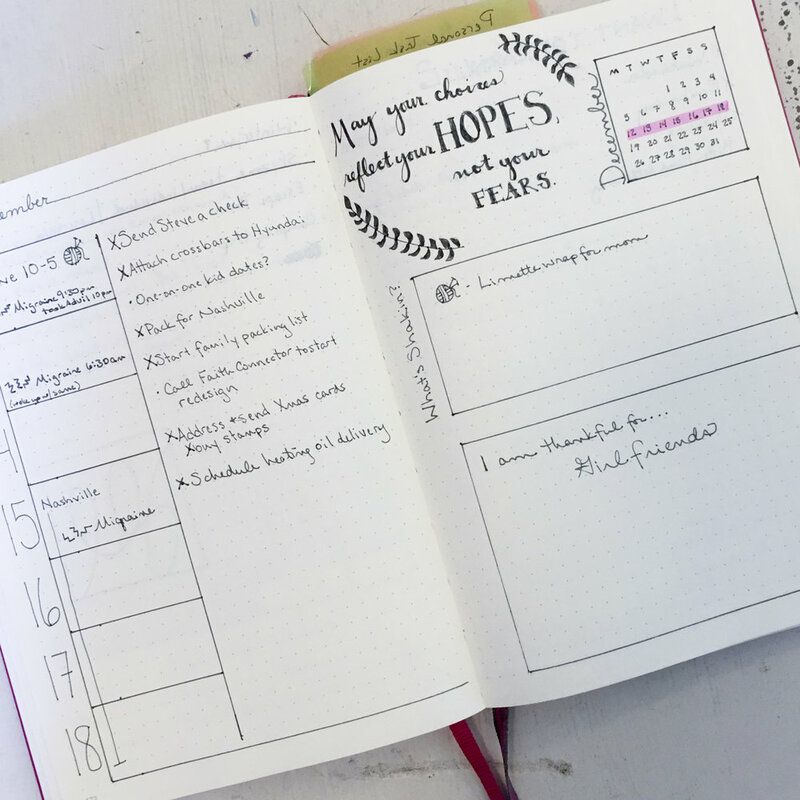 Do you use a BuJo to help you build a focused, creative practice? Let me know your thoughts in the comments below!